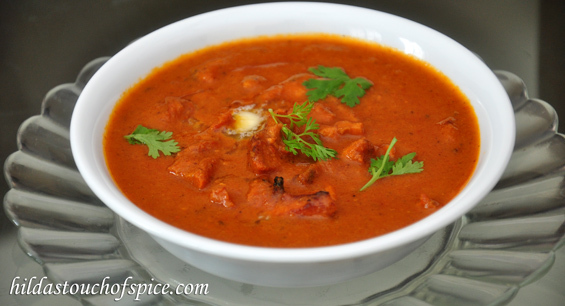 Most of us are familiar with Punjabi Butter Chicken. My family loves Butter Chicken especially my younger son. Many would like to try making it at home, but hold back as they feel it can be made only with a tandoor. Today’s recipe of Butter Chicken is my version which does not require a traditional clay tandoor and yet retains the traditional flavour. Try out this recipe and you will surely feel happy when you achieve the creamy, soft & melt in the mouth gravy which has a lovely color just like the way you see in your favorite restaurant. The mildly spiced smoky chicken pieces in a tangy tomato, yoghurt & soft buttery gravy will not only leave a lingering aromatic aftertaste but will soothe your senses! 2 tsps. Garam Masala pwd. In a sufficiently large bowl, combine all the ingredients mentioned for the marinade. Add chicken pieces & mix well making sure all pieces are well coated. Keep aside to marinate for two hours; preferably overnight. Place 2 pieces of absolutely dry charcoal in a small katori/ metal bowl. Pour about ½ tsp. of desi ghee/clarified butter on the charcoal pieces & light it up. Let it burn for awhile. Place the katori in the marinated chicken. Add a little more ghee if required. Immediately close the bowl with a lid making sure no smoke escapes. Keep the lid on for a few seconds or till the chicken gets infused with the smoke. Open the lid & take off the katori. Proceed to cook the chicken as mentioned below. If you wish to smoke your gravy too then place a mesh on the pan/pot of gravy & infuse smoke as mentioned above. Cook the chicken in its own marinade, without adding water, till almost dry. Cool the cooked chicken & then skewer the chicken pieces & gently roast/burn on a gas flame till you see lightly burned specks on the chicken. When cool, shred into bits & add to the gravy. 20 gms. Kasuri Methi pwd. Heat butter in a sufficiently large pot/wok/kadhai/pan on low heat. Add cashewnut paste & fry till rawness disappears & turns lightly golden. Add tomato puree, tomato ketchup & chilli paste. Keep sautéing continuously & cook on low heat for about 5 mins. Add in shredded chicken, the remaining chicken marinade if any, tandoori color, aromatic spices & kasuri methi powder. Keep stirring continuously & cook on simmer for about 5 mins. Add cream & check seasoning. Serve hot with your favorite Indian flatbreads. You may garnish with a blob of butter or a drizzling of fresh cream. Depending on your comfort level, you may use an electric or traditional tandoor/gas or electric oven/OTG/charcoal grill or grill pan; to roast/tandoor the chicken. The above recipe for butter chicken is for those who do not have or are not comfortable with the above mentioned gadgets. In case you do not wish to use food color then you may use Kesar/Saffron or a few strands of powdered mace. Do not add water as the pureed tomatoes have enough water. Hi! I was going through your recpe of Butter Chicken, I too make in a similar way. The only differnce is I do not add the charcoal as you have mentioned. Just one query. As regards the charcoal you have mentioned to Place 2 pieces of absolutely dry charcoal in a small katori/ metal bowl. Pour about ½ tsp. of desi ghee/clarified butter on the charcoal pieces & light it up. I Did not understand how you have to light this is it directly on the charcoal. Or you have to take a matchstick and light it directly on the charcola. Please explain. So that henceforth I too can do it this way. You have to pour the ghee on very dry charcoal & then light it up. If it is really dry it will catch fire immediately. Place it in the prepared butter chicken & then cover the dish so that the smoke is infused in the butter chicken. If the charcoal is not dry enough then light it separately till well lit & then pour the ghee on it. Place the burning charcoal on the mesh in the dish. The moment you cover the fire will go off & smoke will emit. Best recipe ever… Thank you….